Padre is providing construction monitoring for regulatory permit compliance and environmental oversight for the Mallard Farms Pipeline Replacement Project. 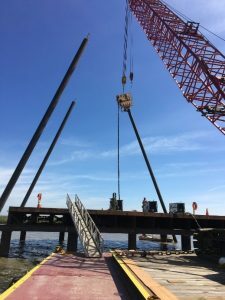 The project involves the replacement of an approximately 1.7-mile segment of refined products pipeline from Honker Bay to the Grizzly Island Wildlife Area in the Suisun Marsh area of the Delta using horizontal directional drilling (HDD) techniques. The project requires the construction of a temporary work platform for the HDD drill rig in Honker Bay and the temporary construction of an HDD drill pad in wetland habitat in the Grizzly Island Wildlife Area. Padre provided biological services support for the project including the completion of protocol-level surveys for Ridgway’s rail, rare plant surveys, and pre-construction breeding bird surveys. Padre is currently providing construction monitoring support for regulatory permit compliance. Construction monitoring includes underwater noise monitoring using a Reson TC-4033 hydrophone during pile driving operations associated with construction of the temporary work platform. Underwater noise monitoring is being conducted to ensure project compliance with peak sound pressure level thresholds set forth in the California Department of Fish and Wildlife Incidental Take Permit for protection of listed fish species (delta smelt, longfin smelt, and winter-run and spring-run Chinook salmon). Padre is providing on-going support through the construction phase of this project which is expected to be completed in summer 2018.